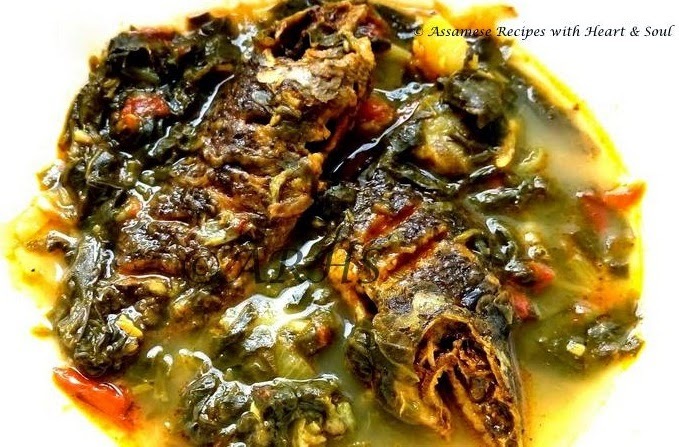 This recipe cooked truly in Assamese kitchen is called ‘Climbing perch/ Anabas testudineus cooked with spinach & tomato’ and in Assamese language it is to b e named as ‘Paleng Xaak Aru Bilahir Logot Kawoi Maasor Jool’. Now add sliced onion, ginger garlic paste, green chilli and fry for some time. Add turmeric powder, cumin powder and fry well. Now add the tomato pieces and mashed potato, fry for two minutes. Add chopped Spinach leaves, salt and cook for another 5 minutes. Now add two cups of water and let the gravy boil. Cover with a lid and let it boil for another 5 minutes. Put the pieces of fried fishes into the gravy, cover the lid and put it on medium flame for about 10 minutes.